Darwyn Cooke's PARKER graphic novel, THE HUNTER, debuted in the #3 spot on the New York Times' list of best-selling graphic novels this week. And even more impressive, it actually got front page coverage. The larger piece about the book (which also includes a write-up about David Mazzucchelli's masterful, hopefully Pulitzer-bound ASTERIOS POLYP and Neil Gaiman's "Whatever Happened to the Caped Crusader" BATMAN two-parter) can be found here. 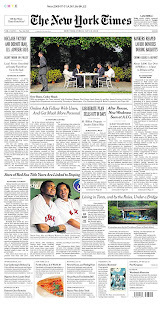 But the important thing is, we made the front page of the New York Times. Word around town is you guys had another book debut at number 1 on the NY Times Best Seller List. I think it's heresay though. aaaand I spelled "hearsay" wrong. Yeah, ANGEL VOL. 4 debuting at number 1 was just great. Especially for a volume 4. If we'd been online during the con last weekend, we would've shouted about that one from the rooftops, too.